It's a shrunken Big Muff. EHX took their famous Big Muff Pi and shrunk it to a pedal board friendly size. Electro-Harmonix promises that the Nano Big Muff Pi sounds exactly like the original Big Muff Pi so there are no down sides to this down-sizing. Load both to the TonePedia player and see how similar they are. Sound wise what is there to say?! 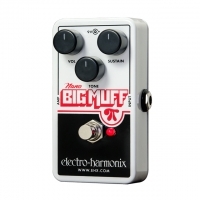 The Big Muff is a rich fuzz / distortion pedal that delivers violin-like sustain. It is one of those pedals that shaped the face of Rock and Roll. Glad to see it evolves. Our demos are recorded in a professional studio designed especially for the kind or recordings we do. We do not try to make things sound good, we show the world how good they sound. Find out about new gear demos, industry news, giveaways and new features.